Stretching from the snowy peaks of Canada to the tall pine trees of Russia, boreal and temperate forests are an important gift of nature to the world's northern hemisphere. These comprise of a belt of coniferous forest that encircles the northern hemisphere, running through North America, Europe and Asia. Boreal forests are critical for carbon storage, with many conifer and broadleaved forests in sub-polar regions growing on huge below-ground carbon stores in the form of peat. Found in such places as eastern North America, northeastern Asia, and western and eastern Europe, temperate forests are a mix of deciduous, broadleaved and coniferous evergreen trees. They are simpler in structure than tropical forests and support a smaller number of tree species. Temperate forests have been decimated over the centuries, but are now expanding in many areas and actively building carbon stores. Some temperate forests receive so much rain they are sometimes called rainforests. The great Douglas fir and hemlock forests of the United States' Pacific Northwest and Canada's British Colombia receive more than 2,000 mm of rain a year. They are dominated by coniferous trees. Another type of temperate, evergreen rainforest occurs in Chile, South America. Here there is a great diversity of broadleaved trees including the Southern Beech. Broadleaved trees have big, thin-skinned leaves which allow them to absorb maximum sunlight. These leaves are delicate and vulnerable to winter winds, frost and snow. Broadleaved trees that grow in colder areas shed their leaves in winter - they are deciduous. In autumn, the leaves turn beautiful shades of red, orange and yellow before they drop off the trees. Common deciduous trees are the oak, elm and beech. Others are maple, lime and chestnut. In much of the northern hemisphere, most of the natural broadleaved forests have been cut down to provide farmlands. 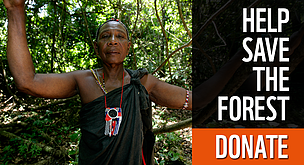 Forests survive only in small patches, or on mountains. The only large areas of forest left are the coniferous forests of northern Scandinavia, Siberia, the north western United States, Canada and Alaska. Even here, there are few areas of forest left that are in their natural state. Temperate evergreen forests are found predominantly in areas with warm summers and cool winters, and vary enormously in their kinds of plant life. In some, needleleaf trees dominate, while others are home primarily to broadleaf evergreen trees or a mix of both tree types. Low annual temperatures characterize northerly latitudes; precipitation ranges from 40-100 centimetres per year and may fall mainly as snow. Russian boreal forests (known in Russia as the taiga) represent the largest forested region on Earth (approximately 12 million km2), larger than the Amazon. Canada is home to 30% of the world's boreal forest. The Northern Cordillera boreal forest of Canada have been identified as the "Serengeti" of the Far North due to its abundance and diversity of large vertebrates. The world’s circumpolar boreal forests and peat-lands are reported to contain as much as five times the carbon of the world’s temperate forests, and almost double the carbon in tropical forests*. 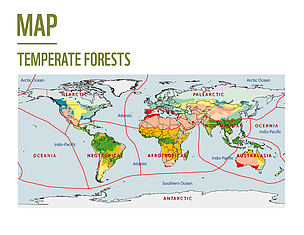 Temperate evergreen forests are found predominantly in areas with warm summers and cool winters, and vary enormously in their kinds of plant life. Temperate rain forests only occur in seven regions around the world - the Pacific Northwest, the Validivian forests of southwestern South America, the rain forests of New Zealand and Tasmania, the Northeastern Atlantic (small, isolated pockets in Ireland, Scotland, and Iceland), southwestern Japan, and those of the eastern Black Sea. Unlike tropical forests in the southern hemisphere, temperate forests in much of the northern hemisphere are expanding.